Please read the FAQ below. If your question isn't answered, please click the last link below. Purchase Download Credits for just $1.00 each and download our detailed PDF Lesson Guides. start with our Beginner lessons. You can work through them sequentially, starting with the oldest ones and working forward, or you can select lessons at random. The earlier lessons are more simple than those that come later. 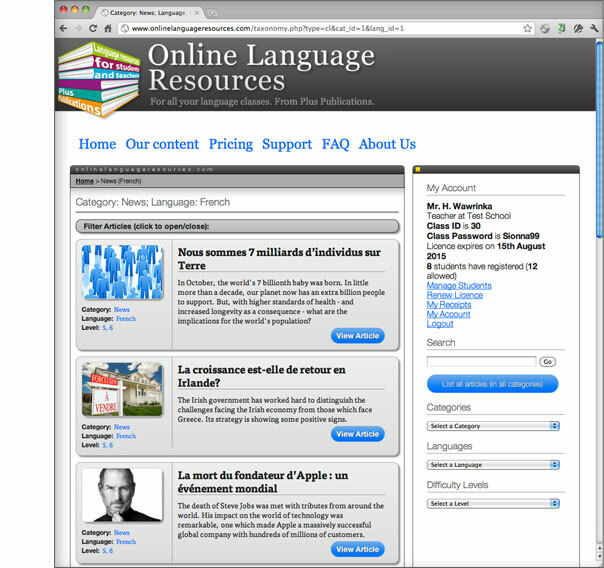 Our French articles available from our site at Online Language Resources will certainly be of interest to you. Here at LFBP you've worked on listening and speaking. Our articles on OLR will help improve your reading and writing. 2. How do I download the audio files? 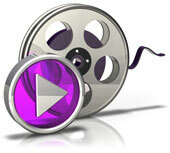 Using iTunes Player – on either PC or Mac – is the simplest way of downloading and keeping track of our audio files. The easiest way of keeping track of our audio lessons is to use iTunes Player (either on a PC or Mac). If you don't already have iTunes Player on your computer, download and install it quickly and easily from here. Find out more about managing podcast audio here. If, however, you don't want to use iTunes Player, you can download our audio files to your computer directly from our site. right-click (PC) or control-click (Mac) the "Play" button of whatever lesson you're working on. A contextual menu will pop up (see image below). 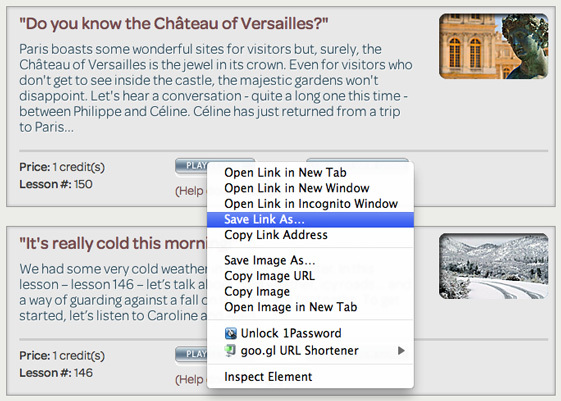 Select "Save Link As…". A Save dialog box will appear. type a filename (or use the one given), e.g. "LFBP_001.mp3"
3. I can't print the Lesson Guides. Our Lesson Guides are in the form of PDF documents. You can read and print our PDFs easily with Acrobat Reader software (freely downloadable from the Adobe website). 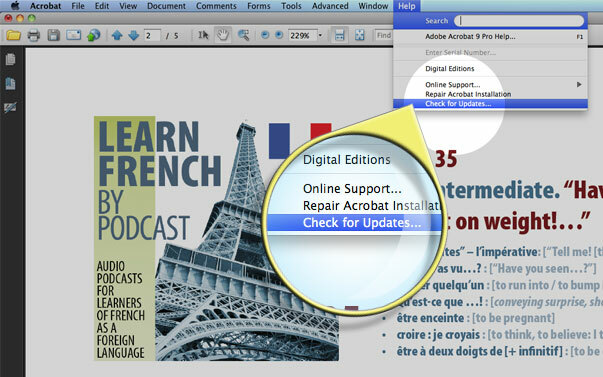 If you have trouble printing, make sure you have a recent version of Acrobat Reader by choosing 'Check for updates…' from the 'Help' menu in Acrobat Reader. 4. I'd like to buy Download Credits. What are my payment options? … to make your payment via our Realex gateway. Realex is a major processor of online payments. They handle payments for many companies, including Vodafone and Aer Lingus. PayPal needs no introduction as a processor of online payments. You can pay via our PayPal gateway, whether you have a PayPal account or not. Our PayPal gateway also allows for payment via e-Check. 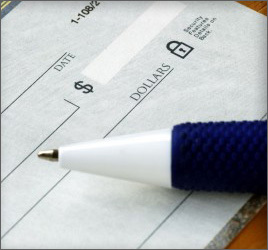 Note e-Checks take from 3 to 9 days to clear, depending on your location. If you purchase Download Credits on our site via e-Check, your LFBP account will continue to show 0 (zero) Credits until your e-Check clears. 5. I emailed you, but I didn't receive a response. your ISP (Internet Service Provider) has wrongly interpreted our email as spam and has rejected it. Click on the Options button. If you are using the full version of Hotmail instead of the classic version, select More options… too. Select Safe and blocked senders under the Junk e-mail heading. On the next page, click on Safe Senders to bring up the entry form. Type our email address: . Click Add to list >>. 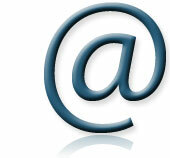 If you still do not receive a response from us, please use an alternative email address. It is very frustrating for us – and for you – if your email address blocks our messages, prevents us from making contact with you. 6. Do Download Credits have a time limit? LFBP Download Credits do not expire. Use them at your own pace. No. Your Download Credits remain in your LFBP account until you use them to download PDF content from our site. There is no time limit on the Credits. 7. I made a purchase but my LFBP account shows 0 Credits. you have made a payment via e-Check. Credits will be applied to your account as soon as your e-Check clears. See also 'What are my payment options? ', above, for more information about PayPayl e-Checks. a 'timeout' occurred during your payment because of a slow - or temporarily slow - internet connection. Please contact us if your LFBP account is showing 0 credits. We will manually apply your purchased Credits to your LFBP account. The likely cause of your seeing 0 credits is that you created more than one LFBP account and are logging into the wrong one. Please let us know that you are seeing 0 credits and we will resolve the issue for you. 8. How do I transfer PDFs to my mp3 player? log in to LFBP and click the View PDF Guide button associated with the lesson you're working. Note, however, that the Guide will remain available only for as long as you have the Guide open. When you close the Guide (to revert to browsing, for example) the Guide is not saved to your iPhone/iTouch. consider using a utility like Air Sharing which is available from the App Store. (If you're on a Mac, watch this. If you're using a computer running Windows or Linux, see specific instructions for those platforms here, at the developer's site and click the 'Configuring Air Sharing' link.) Air Sharing allows you to connect your iPhone/iTouch to your computer wirelessly and copy files from your computer into folders on your iPhone/iTouch. Air Sharing is a paid application but there are other utilities with similar functions also available, including Files Lite, Datacase and FileMagnet. Please search the App Store for further information on file transfer utilities. We use an App called Air Sharing from Avatron Software, Inc., to transfer PDFs to our iPod/iTouch/iPad. download a utility like Air Sharing (see image below), Files Lite, Datacase or Filemagnet from the Apple Apps Store and use one of these utilities to copy (and save) PDFs and other file formats to your iPhone/iTouch. 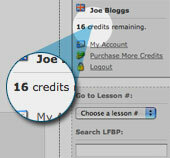 A purchase of LFBP download credits allows you to work with our content for your own, personal use. Your own purchase does NOT allow you to use our content with a group of people, for example in a classroom context, or in any other group-learning environment. If you wish to use our content with a group of people, please contact us. We will be happy to provide you with a site licence quotation on the basis of the number of people in your group. 10. Is LFBP content copyrighted? 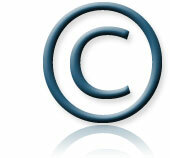 Yes, all content we produce is protected by copyright. Plus Publications’ content may NOT be modified, reproduced, transmitted, re-purposed or copied (in a manner other than as specified in the section entitled ‘Purchased content: for your personal use’, above, and in our Terms and Conditions) by any means or in any form without prior written permission of Plus Publications. If there is a particular reason why you wish to reproduce any of our content, please contact us for further information and permission. © All rights reserved. 11. I have a question unrelated to the above.